For the second year in a row, Brute Squad will roll into the party as a comfortable no. 2 seed. The spot shouldn’t bother them this year, with all that gold hanging around their necks. They’ve already beat Ozone handily twice this season, and the rest of their record is swathed in green. 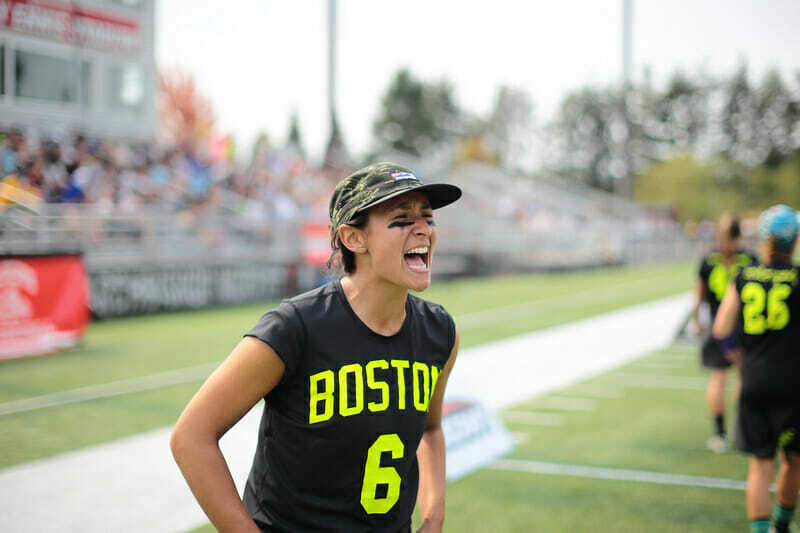 Come for the beautiful ultimate in pool play, but don’t count on any drama from Boston. Ozone is always a no. 2 seed, rarely a bride, and this doesn’t look like the year for them to do anything more. They’ve let strong teams like Nightlock and Heist play tight with them, and both Pop and Rival could rack up points on them. But this isn’t the best pool to bet on a no. 2 seed upset. Ozone has simply been here before. Pop and Rival are a tricky pair as the no. 3 and no. 4 seed. They played an intense and close game early at Pro-Elite Challenge, but their match during pool play could go either way. Rival has the big stage experience over Pop, but the young Minneapolis team knows how to hang tough, especially with the bracket on the line. It’s been another strong year for Boston Brute Squad. After back to back Championships, the bar is so high for them that it feels almost disappointing for them to have only won Pro-Elite Challenge and Northeast Regionals. Can 21-2 (plus a win over MUD and a loss to Revolution) really be a disappointment? At this point, Boston could still be the favorite to win the National Championship, after a similar regular season in 2016 gave way to another defense-led title run for them. They’ve earned our respect and some slack. It’s hard not to believe they’ll collect themselves for another exceptional performance at Nationals. The team underwent some tough transitions, most notably losing star handler Leila Tunnell, yet has still remained at the top of the division. Kami Groom and Lien Hoffmann are dominant athletes that can win battles on either side of the disc with regularity. Becky Malinowski continues to abuse defenses with her size and disc skill. Amber Sinicrope is still a dynamo with the disc. Claudia Tajima seems to have hit her stride. Yet the strength of Brute Squad has been their depth, particularly on defense. Heck, even their offensive line has been pretty elite defensively these past two years. With two full capable D-lines, Boston was free to apply relentless pressure knowing they had 20 other teammates who could reliably do the same. That was how they put teams in a stranglehold. We haven’t quite seen the same fire from them this year. They took on a large class of rookies, and instilling them with the same discipline and tenacity is a challenge that takes at least a season to do. So teams should be on alert for them to be more cohesive at Nationals. The other question is what we will see from their offensive unit, which underwent some shifts after losing key personnel. Tunnell is the big name, but Laura Bitterman had been in All-Club form for years and Courtney Kiesow was a very smart contributor. Tajima has taken on a lot of Tunnell’s touches, with Sinicrope, and rookies Jojo Emerson and Tulsa Douglas joining her in the backfield. Hoffmann and Malinowski return as dual threats downfield, with speedy Becca Ludford and disc-moving Elena Schwam joining the O-line. That’s a lot of moving parts to ask for championship-level play from, especially when the going gets tough in Sarasota. For whatever concerns there are – and it’s easy to pick the nits until you lose sight of the fact they’ve dominated nearly everyone besides the other top teams – the setup looks positive for Boston. While the only team in their pool that they’ve seen is Ozone, they thumped them 13-6 and 15-7 in their two meetings. Most of the teams they’d likely see in quarters – 6ixers, Nightlock, Showdown – they’ve already beaten. The path is far clearer than the outcome. If you wanted to draw up what was expected from Atlanta Ozone this season, it would probably look a lot like what has happened. They’ll arrive in Sarasota as the No. 7 seed overall, the second seed in Pool B. All in all, that’s pretty similar the No. 9 seed they entered Nationals with last year, exactly the same as the No. 7 seed they carried in 2015 and very close to the No. 8 seed in 2014. Even with an aberrant No. 12 seed in 2013, they were again No. 7 in 2012. The team has been starved for big wins and for breaking through at Nationals. Those finishes over the past five years (in order): 7th, 9th, 5th, 9th, 8th. Those results mostly fit the trend. And while the team is proud to have been consistently one of the strongest teams in the women’s division, there certainly seems to be some frustration from being stuck in place. Unfortunately, there aren’t a lot of signs this season that they can get off the treadmill and move forward. They are 19-4 against teams outside of the top 4 seeds and 0-4 against those elite teams, coming no closer than within three points on the final scores in those challenging matchups. There’s been some inconsistency, as two of the teams they lost to — Nightlock and Underground — are teams they beat in the same weekend. Perhaps this inconsistency comes from a lack of offensive dynamism. Atlanta, as an ultimate city, has long been associated with the aggressive deep game, and Ozone this year seems to be leaning into that identity. With the personnel, that makes some sense. Katherine Wooten, Haley Reese, and Sophie Darch are all equipped with huge throws. It’s been Mira Walker and Kate Travaglini hauling them in, and Travaglini has been particularly devastating after last year’s Breakout Player of the Year season for Phoenix. But when that deep game isn’t connecting, there hasn’t been much of a second option. The defense doesn’t create a ton of short field opportunities, perhaps playing a bit more conservative. When Ozone’s offense takes, they are liable to light up even a disciplined defense. However, if they fail to get traction, they may struggle if they can’t force defenses to defend something a little different. Alternatively, they could clamp down on defense and start to turn the tables that way. Expect these to be the areas Atlanta has focused on improving when they get to Nationals, hoping to change the patterns that have made them such a safe bet these past few years. Minneapolis Pop returns to Nationals for the first time since 2010, back when the regions were bigger and sublimation was all the rage. This year, Pop is bringing a new crop of young talent to Sarasota coupled with marquee talent like Anna Reed and Courtney Kiesow (in her first year with Pop). Their roster skews heavily toward first and second-year players, for whom Sarasota will be their first Nationals experience. Despite the skill baked into this team, their auspicious return in pool play could also be the beginning of a steep learning curve. Pop’s experience does shine in their handling core, however. Chip Chang, Dre Uhl, Anna Reed and Makella Daley all play important minutes in the backfield, and when defenses apply pressure to Pop’s downfield, the handlers will swing and reset patiently until an option appears. This composure helps the team navigate poach defenses and zones and could be particularly useful in Sarasota’s infamous wind, but their downfield will have to work harder for opportunities against some of the division’s best defensive schemes. Pop earned their stripes this season with strong 5th place performances at Select Flight Invite and Elite Select Challenge. But the game they’ll draw on this weekend is their intense 12-11 win over Rival at Pro-Elite Challenge. That double game point finish wasn’t easily won, but they’ll have to recreate the magic in order to reach pre-quarters. Their games with Brute Squad and Ozone, well, they will be excellent learning experiences for Pop. Brute Squad will be the highest ranked team Minneapolis has played in at least five years, while Ozone’s deep, aggressive play style will push Pop’s defensive stamina. Pop has spent many long years in the Select Flight. If they can break into the Elite Bracket at Nationals, the weekend will be success. Columbus Rival celebrated their first Nationals appearance last year by breaking seed. They upset Showdown to steal the no.3 seed spot, and their highlight reel games created small moments of glory against the bleak Rockford landscape. They return this year as the Great Lake Regional champions once again. Their 15-11 win over Nemesis at Regionals didn’t disqualify their Chicago opponents this time, but the back-to-back wins for Rival could be the seeds of a trend. This still-nascent team – borne out of the rivalry between Michigan and Ohio State – is becoming a Midwestern powerhouse. Fitting to their name, Rival’s best players again this season are a potpourri of former Michigan and Ohio stars. Sara Scott returns as well for Rival, and can still get open at will before turning to fling a flick huck deep. Hannah Henkin and Tracey Lo still slice up the field with their insides and around breaks respectively, while players like Sophie Knowles and Brittany Wright have shifted into even bigger roles downfield this season. After a 3-3 weekend at Pro-Elite Challenge, Rival stomped through Select Flight Invite to beat Nemesis 13-9 in the final. The win was likely all the sweeter after Rival lost by one point in the same game last year. While Rival lost a healthy serving of close games at Elite Select Challenge – including a one point loss to Nemesis – their 5-5 record against the Nationals field belies how worrisome they should be as a no. 4 seed in their pool. Pop is well within Rival’s upset range, and Rival’s gunslinging approach matches them well against Ozone. Rival and Brute Squad shared Pool B at last year’s Nationals, and anything better than that 15-5 blowout will count as success for this Great Lakes team. Rival plays big-game ultimate well, and in their sophomore year at Nationals they’re no strangers to the drama or the upset potential. Under sunnier skies than last year, Rival is ready to make noise again. Comments on "Women’s Pool B: 2017 Club Championships Preview"